← Increased Power Outages . . .
Photo: The 5.04-metre great white was tagged by Fisheries officers off the coast of Albany last month. 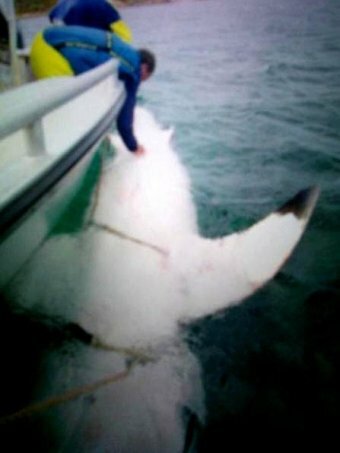 An image of one of the biggest great white sharks ever tagged has sparked a flurry of online interest and a fresh warning to swimmers off WA’s south coast. The 5.04-metre shark, the largest ever fitted with an internal acoustic tag off the Australian coast, was detected near Albany at the weekend when a distressed whale beached itself. The City of Albany closed beaches on Saturday and the carcass was removed, but the massive shark is believed to have remained in the area. The shark was fitted with an internal tag last month when it was swimming near Mistaken Island off the Albany coast. Department of Fisheries officers hooked the great white and flipped it onto its back near the side of their boat. The department’s Mark Kleeman said a photo taken during the procedure shows the shark in a state of temporary paralysis known as “tonic immobility”. “In a sense the shark basically goes to sleep, which enables our technical officers to do a small surgical procedure to implant an acoustic tag inside the shark’s gut cavity,” he said. At the time it was taken the Fisheries officer was completing the final stitches to the female shark’s belly as it lay docile in the water. Mr Kleeman said the shark woke up as soon as it was flipped over. “It was an impressive feat,” he said. “In this instance the shark came pretty much instantaneous back to life. He said the tag – the second to be attached to the animal – would allow it to be monitored for the next 10 years. The giant great white has been detected periodically near Albany since it was tagged. It was last detected at Ellen Cove, near one of the city’s popular swimming beaches, at 5:44am (AWST) today. Mr Kleeman said swimmers near Albany should be cautious for the next few days. “Obviously with that whale incidence and the distress signals that would have sent out, it would have attracted sharks and they will probably frequent the beach on and off for the next few days,” he added. Western Australia currently has a catch-and-kill policy for great white, tiger and bull sharks larger than three metres that come close to certain beaches. The State Government recently moved to extend federal approval for the divisive program for another three years. WA introduced the policy of setting baited drum lines off five Perth beaches and two in the south-west following an increase in fatal shark attacks in the past 10 years. Albany does not have baited drum lines off the coast. Federal approval for the policy only lasts for three more weeks and in order to be extended, the program will have to face a full environmental assessment under Commonwealth law. Under the proposal, the WA Government would set up to 60 baited drum lines off metropolitan and south-west beaches from November 15 to April 30 each year. Another 12 would be held in reserve to be deployed when sharks over three metres come close to WA beaches. Lines would not be set in any proposed marine sanctuary zone, gazetted or proposed recreation zone in any Western Australian marine park or designated fish habitat protection area. Since the program’s inception the Government has been forced to fend off countless protests and a Supreme Court legal challenge. ABC Fact Check: Can governments protect people from killer sharks? In March, the Environmental Protection Authority (EPA) ruled out assessing Western Australia’s controversial shark cull, saying it posed a negligible risk to the species. The decision to cull has been controversial and there have been a number of public protests. The EPA was called on to assess the policy and rule whether it was environmentally acceptable. It received 23,000 submissions during a public consultation, which ended in February. In March, Sea Shepherd failed to get a Supreme Court order to stop the cull. It had argued the catch-and-kill policy had been improperly introduced, but the Supreme Court ruled the introduction of the drum lines was valid.